What Do the Steel Fabricators Do and How to Choose Steel Fabricators? Steel is an extremely durable, multi functional metallic alloy which is constituted of carbon, iron, small quantities of phosphorus, sulphur, oxygen, manganese, silicon. Carbon among all is a hardening ingredient which offers durability and hardness to the steel. Steel is a vital part of our lives and we are always surrounded by machines and tools made up of it. Whether it is the office building, the home or a bridge, they all have steel framework. All the electrical appliances and stainless steel utensils make use of steel as the major component. Heavy machines used in the industries, tools and equipment are made from steel. To manufacture them from steel, we need professional steel fabricators. They can make steel structures, steel products as they are experts in cutting of steel, bending, assembling and processing of steel components. Steel fabricators can make the sheets, pipes, plates by simply welding the steel into various shapes. Different elements are used to prepare the final products. What is the role of steel fabricators? 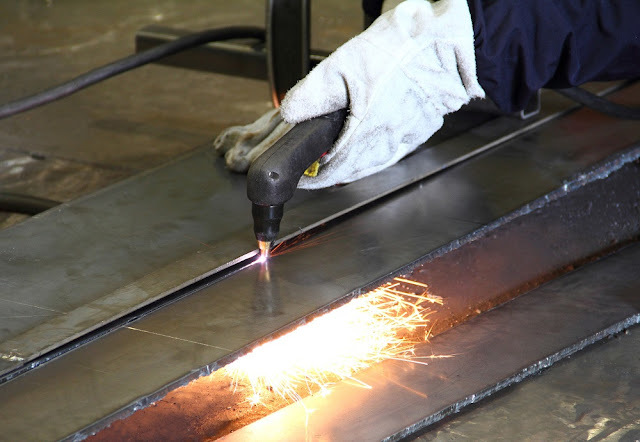 Steel fabricators make use of machines, laser cutters, flame torches and other equipment to manufacture the products. If it is the task of the structural engineers to make the designs, prepare drawings, blueprint of machines and steel structure, it is steel fabricators who make the end product. Steel fabricator transforms the drawing and blue print and makes them into a usable final product. They make use of special tools to prepare structural framework. They can cut down the materials into the required sizes. The final steel structure is prepared only after a series of steps followed by the fabricator. He can change the shape of the steel with the help of special tools to prepare the structural framework. They may cut down the steel into the sizes needed. Here the various parts are welded in order to make the final steel structure or the component. Finally, the finished product is primed, sand blasted and then painted to be able to get delivered. • You need to ask about the products they offer and in what way the items can be customized. Make sure the company manufactures the products as per your exact specification. There are some shops that are just limited to manufacturing only a certain kind of products. So, there is a limit to the supplier and buyer relationship. • You need to decide what your needs are. Along with this, consider the needs that might evolve in the future. Inquire from the supplier and the manufacturer whether they can cater to your needs or not. • Ask about the past projects and the work accomplished in the past. You must definitely check out the portfolio of past projects as that can prove the credentials of the fabricator. • You can also ask about the repeat customers created by the steel fabricators. It will be good if you can check out the website of the steel fabricator. Read up the feedback posted on the site and then judge the abilities. You may ask for references and project details. If the company is good, it will be happy to assist you.